Contact us for Special Education Pricing. SMART 7075 75" 4K Ultra HD Interactive flat panel with iQ and in built Android PC. Includes 1 year SMART Learning Suite Software. 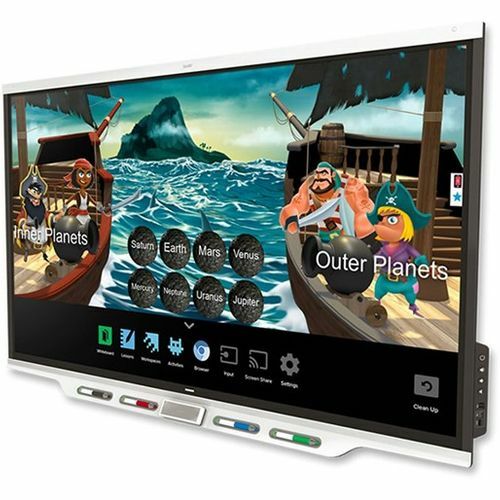 The 7000 series is the most advanced SMART product and includes exclusive iQ technology bringing devices, lesson content and software together for a cohesive educational experience. The advanced features help teachers and students collaborate with ease. PC free embedded computing providing one touch access to a diverse suite of SMART applications - Notebook lessons, amp workspaces, lab gamification activities and whiteboard, plus collaborative tools, such as wireless screen sharing and a web browser. Designed for whole class, small group and individual learning, this is the pinnacle of the SMART experience. SMART LEARNING SUITE SOFTWARE - SMART Learning Suite ensures that you get the latest SMART Notebook enhancements, plus access to SMART amp, SMART Lab and SMART Response 2. The 75" 4K ultra-high definition LED display provides optimal image clarity and wide viewing angles. With the Pen ID feature you can assign different appearances to the two pens and write or draw over any application in digital ink. Object awareness allows you to perform mouse functions with your finger, write in digital ink with the pen and erase with your palm or eraser - all without switching tools or modes. You can use a variety of gestures in applications and two users can write or draw at the same time.